Dinosaurs have appeared in films before. Some good, some bad. Chris Pratt has appeared in films before. Most good, one bad; I’m talking to you Movie 43. So, in the spirit of Jurassic World’s genetic scientists, why not get these two crazy kids together and see what happens? Just like in the film, the result is a new dinosaur – bigger, faster, and more teeth. Accordingly, Claire has been killing it for Masrani. Park attendance spikes every time a new attraction is unveiled, and Inominous promises to be the most impressive attraction yet. When questions about proper containment of the Indominous Rex arise, Masrani asks Claire to bring in former Navy recruit and current Velociraptor behavioral researcher, Owen Grady (Chris Pratt). Claire’s history with Owen is a bit rocky due to a rough first date a while back, but Owen’s success training Velociraptors makes him vital to identifying any faults that may weaken the containment of the new dinosaur. Since discussing the rest of the movie hinges on this point, I don’t think I’m spoiling anything when I say that, yes, Indominous Rex escapes. And what makes matters worse, Claire’s young nephews Zach (Nick Robinson) and Gray (Ty Simpkins) happen to be visiting the park when all hell breaks loose. Soon enough they, along with thousands of other visitors, are stranded in the park as Indominous Rex wreaks havoc. What follows is a terrifically entertaining prehistoric version of Predator. I loved almost every minute of Jurassic World. Of the three sequel films, this one comes closest to capturing the majesty of the original. 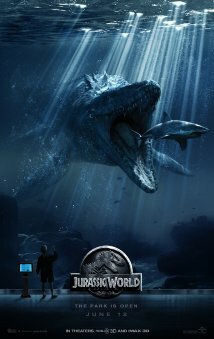 In an early scene, composer Michael Giacchino masterfully echoes John William’s iconic Jurassic Park theme to tremendous effect as Jurassic World is revealed for the first time. This film (wisely) distances itself from the Jurassic Park sequels and effectively reinvents itself, but not without a few welcomed references to the original film. Jurassic World, at its core, is a standard creature feature, but it is extremely well executed. The effects famously pioneered by Steven Spielberg for the 1993 film have evolved to something even more outstanding this time around. Furthermore, a sense of fun noticeably missing from Jurassic Park: The Lost World and to a lesser extent Jurassic Park III, is back with Jurassic World. I grew up loving the novels of Michael Crichton, and Jurassic Park was the novel of his that sparked my obsession with his books. Crichton would only live to write one follow up novel to Jurassic Park, and that was The Lost World, which was a great book but cinematically butchered by Steven Spielberg. Thankfully, writer Rick Jaffa and director Colin Trevorrow seem to have the same esteem for Crichton as I did and have made a film more in the spirit of his writing. Jurassic World is rated PG-13 and has a running time of 2 hours and five minutes.